Too much concern over legacy is dangerous in stories. It tends to make them backwards looking and self-referential instead of developing their characters and plot to a conclusion. It’s also a nearly irresistible urge with long-running (and sometimes even short-running) film franchises which almost always live under the shadow of the first installment. Where did we come from and what does that say about where we are now? How to Train Your Dragon: The Hidden World, the final installment in DreamWorks’ long running film and television series, attempts to thread that delicate needle, creating a new status quo for its characters while making sure to remind us what we liked about the series in the first place. It doesn’t quite live up to the legacy of its forebears, but it is heartwarming and engaging enough to make for a strong send-off. 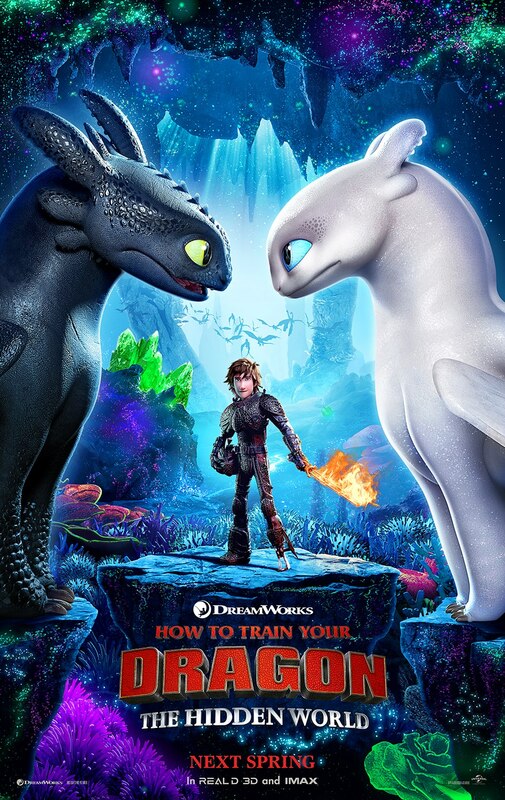 With its formerly youthful heroes now entering young adulthood, Chief Hiccup (Baruchel) and the people of Berk have settled into an easy routine of rescuing and raising the dragons of the world from would be poachers. But if Hiccup refuses to admit it’s an equilibrium which cannot last the poachers won’t be so forgiving, eventually hiring the greatest dragon hunter of al time (Abraham) to ensnare Hiccup’s faithful friend Toothless and all of his dragon tribe. The dragons’, and Berkians’, only chance is to find the fabled Hidden World and leave their old way of life behind forever. That choice may be taken out of their hands, however, when the dragon hunters unleash the one thing Hiccup and Toothless aren’t prepared for … the only remaining female Night Fury. It’s a choice which is in some ways a refreshing break from what the series has done, but in others is literally the only thing they could have done. For a film which has legacy and the necessity of change on its mind, Hidden World is relentlessly conservative. It’s supporting characters remain the loose set of tics and bits which were just good enough the first time around but have become primarily annoying and pointless by movie three. And it’s villains are just new versions of the villains from the second film, wanting the same thing for the same reasons and going about their goals more or less the same way. It’s as if the focus of the film was somewhere other than it’s plot, an annoying necessity existing because it most. Because the focus is somewhere else and when it gives itself over to those ideas, Hidden World actually takes flight. Most of that is built around the only truly original addition to the newest film, a romantic interest for Toothless that may be enough to tempt him away from his old friend and life once and for all. Most of the scenes with the ‘Light Fury’ are brimming with energy and playfulness in the way a lot of the rest of the film isn’t, in part because they are the few times the non-talking dragon characters are given center stage as more than props of action and plot. Toothless’ attempt to woo the Light Fury, told entirely visually, is by far the highlight of the film giving full reign to the animators’ playfulness and inventiveness. If only there were more of it. Not that there’s necessarily something wrong with the ‘if it ain’t broke…’ mentality. A lot of what made the series so enjoyable is still here – Hiccup is as engaging as ever and the gags mostly remain funny. More importantly writer-director Dean DeBloies has had an unerring sense of how to wring true feeling out of Hiccup and Toothless’ travails without diverting into easy sentimentality. Hidden World’s drawn out conclusion benefits greatly from that skill. Yes, it takes the easy way more often than not, and it never really will live up to the first film but that speaks more to that film’s strengths than Hidden World’s weaknesses. Mostly. As big wrap ups go it may not be the best ever but it’s good enough.